Break out the pastels and slip out of that bulky, winter coat. Spring is officially here. Even if it’s still a little cool around your way, winter’s chill will soon give way to 60-degree temperatures. What better time to turn back the clock on aging and give your health a boost. Here’s how to give your looks, your body and your spirit a lift. Take years off your tresses. Almost every woman experiences age-related changes to her hair. Your lovely locks may become thin, dry or dull. To bring back the soft, shiny hair you’ve always enjoyed, try a DIY “pre-poo.” Coat your hair with a mixture of two eggs, a tablespoon of honey and a tablespoon of jojoba oil or a generous helping of food-grade coconut oil. Put on a plastic cap, wrap head in a warm towel and relax. Leave it on for an hour or more, and then shampoo and condition. If you are dealing with more serious issues such as extreme thinning or balding, a recent study found that a compound made from copper and peptides (the latest anti-aging ingredient for skin, as well) may help regrow hair. The Folligen product line includes a spray (24.99) and a cream ($29.90) packed with the compound. Best of all, it does not have to be used with irritating products like minoxidil. It can be effective alone. Eat for anti-aging. 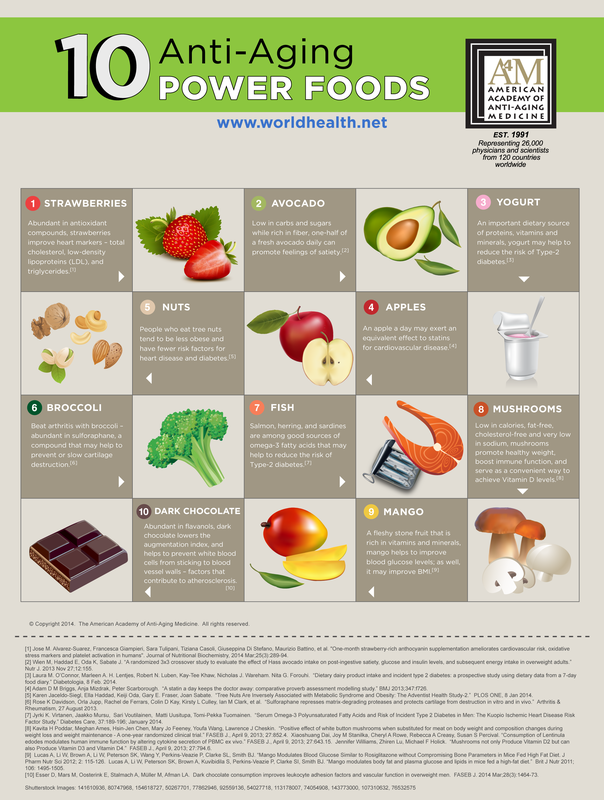 Fill up your grocery cart with the power foods on this chart created by the American Academy of Anti-Aging Medicine. Learn how to get the best health benefits from mangoes, chocolate, broccoli and other nutritious treats. 1. Stay out of your daughter’s closet: There’s no such thing as forever 21. Our bodies change as we age, so even if you’re still a size 6 at 50, you will look best in richer fabrics and outfits cut for womanly curves. 2. Make sure it fits. Nothing ages you faster than an outfit that’s too tight, too short or ill-fitting. And that includes the bra that creates that awful roll of back fat. Toss it out and go shopping. 3. Indulge in color. Black is sleek and slimming, but our gorgeous brown skin absolutely glows when accented with a pop of color. Save the black for skirts and slacks. 4. Don’t dress down. There’s no need to be overly conservative and buttoned down because you’ve celebrated your 40th or 50th birthday. Kiss the minis goodbye and go easy on excessive cleavage, but allow your skirts to grace your knees, show some shoulder or cinch your waist. Drink from the fountain of youth. Start your day with the Five Tibetan Rites, five simple and easy yoga exercises that only take 15 minutes, but have long-lasting health and anti-aging benefits. They stimulate energy, enliven the senses, help to regulate hormones and balance the nervous, digestive, cardiovascular, and respiratory systems. In this short video, Dr. Oz shows you the routine. He’s a daily Tibetan Rites devotee. To make sure that you do something every weekend that’s just for you, we’ll be sharing a little advice to make those 48 hours a great time to recharge your batteries, bring a little good news into your life or discover a quick and easy way to improve your health.